Today brought one pickle of a news story! Bloomberg Businessweek brought up huge allegations, charging that Supermicro (NASDAQ:SMCI)is complicit in a far-reaching state-sponsored spying scheme by the Chinese. The story is wild and we have our security and hardware writers looking into the story in terms of its validity. It’s getting even more contested considering Amazon and Apple have both come out flatly denying the story. We won’t comment on that issue, on whether or not Bloomberg is reporting the truth or not, but we can discuss some of the fallout we’ve already seen today. Bloomberg’s story basically describes a small chip implanted on Supermicro’s motherboards that allowed a backdoor of sorts that would open a pathway for a foreign entity to either gain control or retrieve data from the servers. Supermicro’s servers have found their way into all manner of applications. Companies such as Amazon’s AWS (NASDAQ:AMZN) and Apple (NASDAQ:AAPL)have employed thousands of servers using Supermicro boards, even U.S. intelligence agencies, such as the CIA, have deployed them as well. So it comes as no surprise that investors moved quickly to sell-off shares of Supermicro, given the huge implications. If the Bloomberg piece turns out to be accurate then there’s no limit to the punishment the US would impose on Supermicro, if they were allowed to exist at all. The sell-off was vast and prices reached as low as 50 percent down on the day. 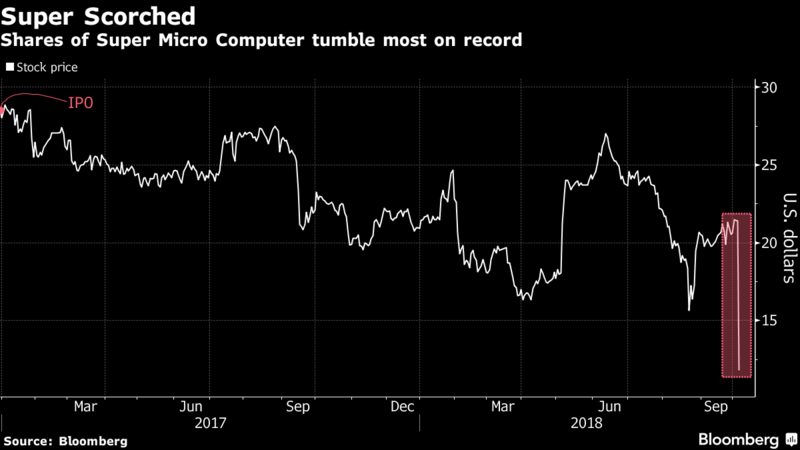 Is it a bit ironic that Bloomberg posted this chart in regards to Supermicro tanking as a result of an article Bloomberg itself wrote? The company has a market cap of just over a half a billion, and today closed at 41 percent down, its worst day since its IPO in 2007. Supermicro, for the last month, has averaged daily volume of around 300,000 shares. Today saw 12.56 million shares traded!